Union High is an innovative non-traditional high school which opened the Fall of 2015! We serve students who desire a different way to approach learning through our Big Picture design principles. Our students define their individualized path to learning "One Student at a Time" through their interests. Union is an accredited high school diploma program which serves approximately 210 students in grades 9-12. We also are proud to serve teen parents in our communities. We have a fully licensed daycare on site, with licensed child care providers to meet the needs of our children and babies so our teen parents can pursue their educational goals. 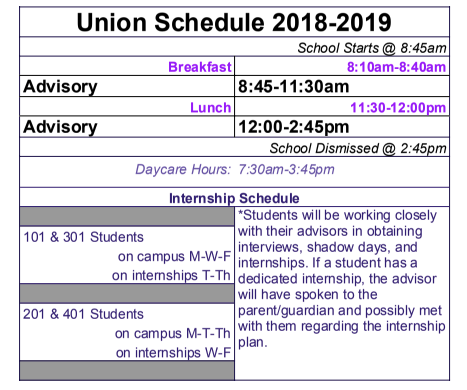 Union High is a small community of learners who pursue interest based learning through community partnerships, project based learning, workshops, and internships. Students may apply to attend Union High school if they meet the qualifications (application available online under the Admissions link or in our office). Union proudly opens its doors to the community for various events and is an asset to the neighborhood and the community at large.